If I had my own cartoon empire, I would animate myself to look a lot cooler. 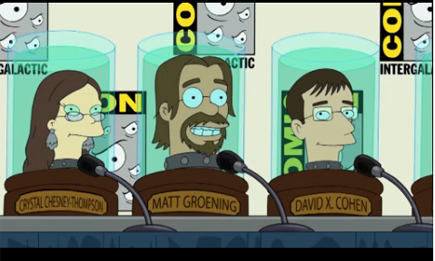 Matt Groening and David X. Cohen didn't really do that for their guest appearance on tonight's Futurama -- unless you think being just a talking head is really cool. Take a look below, and don't expect anything about The Simpsons. Futurama airs every Thursday at 10:00 p.m. (EST) on Comedy Central.